An e-mail arrives from The Fankle. I had stupidly not thought about a title when I was writing it, I was too busy attempting to keep the word count down due to it being a micro fiction edition (stories with less than 250 words). It’s been given the title ‘The Last Drop’ which seemed apt considering the subject matter. The issue isn’t out for a little while yet but they’re will be the obvious post on here once it does land. For those in the Dumfries and Galloway area the magazine can be found here and for those not from the Scottish lowlands then you can get it posted your way by doing this. It’s 85p for a single issue, of which I’ll have written 31 words of the new one, but whilst you’re there why not subscribe anyway? You’d be getting a fantastic slice of what’s going on as far as creative writing goes in Dumfries and Galloway. If you’re that way inclined and are from the area then why not submit something for their consideration? The theme of the next issue will be ‘Resolution’ and the deadline is December 31st 2012 so there’s plenty of time. I’m already seeing what I can piece together. It’s been a fair few years since I was last published in print, about ten to put a figure on it, so this is a very pleasant surprise and goes on the achievement list of 2012 alongside the Henry Barstow performances. I’m giving serious thought to what script to do next and I wonder if it’s time to finally get down to doing a feature film. Whilst I have written scripts over the 90 minute mark before they mostly turned out to be failed experiments when I was fresh out of college. Not having the time or budget to film a 90 minute plus feature in art college you don’t tend to bother writing them. I could have done a feature script written intensively for my final project, maybe I should have done, but by then I was already part of a group who had a framework put together and to leave then would have felt selfish. My last attempt was a good few years ago, it was set on an island on which ten people attempted to set up their own independent country. Having seen Castaway a few years before (the show that gave us such wonders as Ben Fogle) I wanted to do a much darker version of that. It didn’t really go anywhere and there were far too many characters however it did house the first version of Henry Barstow as a character, back in the days when he was a Europhobic MP rather than a deranged writer of rubbish scripts. I do have a core idea to start it with. An event, something which rocks a small town and the aftermath but it needs a flavour before we get anything concrete written down. With that in mind, here’s a few things that I’m considering so far. Not so much the more modern Twilight Zone but certainly the 1960 version, the ones filmed in black and white only. Taking something normal and everyday and adding some strange in to see what comes out. I’m a particular fan of the episode with William Shatner in which he keeps thinking there’s something outside the aircraft he’s a passenger on. If I recall correctly The Outer Limits used to be on BBC2 on a Saturday evening (I’m sure somebody in the comments section will end up correcting me if not). In a very similar style to The Twilight Zone (in fact it was pretty much the same idea updated). One particular episode that sticks in my mind featured an entire 45 minute show in a prison cell on an alien ship. Two humans, one male and one female, attempt an escape but she keeps getting taken away and tortured. Upon each return to the cell she becomes more and more like the alien captors in appearance, gaining scales on her skin and claws on one hand. In the final moments of the show, before she’s taken away again, he tells her not to worry because the human forces are about to launch a surprise attack in the next few hours. The fleet are hidden in the stars waiting to strike and there is hope for the human race yet. She smiles and turns towards the door before saying something like “John, they haven’t been turning me into one of them all this time, they’ve been turning me back”. With one simple line the whole story turns. Bear in mind we’ve never left the cell throughout the whole episode. I thought it was a fantastic piece of sci-fi done cheaply and a good example of a script packing a final punch. 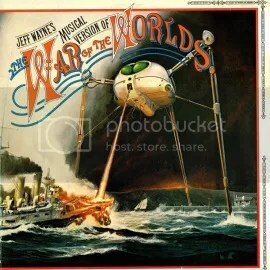 Jeff Wayne’s World Of The Worlds isn’t here really for the story, HG Wells did it first and better, it’s more how I was first introduced to it. A few years ago I was having guitar lessons from a fellow called Donald who worked for my Dad. Upon ending the lesson he’d give me a lift home and, without fail, this would be playing in his car. The journey was very short but during the winter months, in the dark, listening to it felt like the scariest thing ever. Due to this experience my parents bought me tickets for the live version one Christmas. I went along, saw the disembodied floating head of Richard Burton, but for some reason never truly made as much of a connection with it in that form. The Wickerman was filmed not far from where I live actually, in fact they still have a music festival inspired by it, so whilst in the story it’s the very North of Scotland in reality it’s very much Dumfries and Galloway. The Wickerman struck a chord with me because it’s a horror film without any blood or gore and extreme violence. There are no monsters lurking around the island at night eating the residents. 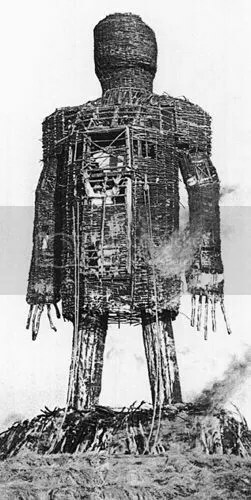 The fear in Wickerman comes from the differences between an outsider and the islanders themselves. This religious tension is central to the structure of the whole film. I’d really love to replicate something like this in the script. I know, I know. Up until now I’ve been mixing in cult movies and TV shows and yet I’m here throwing in a kid’s gameshow from the early 90’s. I was fascinated with Knightmare back in the day, I’d rush home from school to watch it every Friday. There’s a certain air of mystery and imagination in Knightmare that simply wasn’t present in other kid’s TV shows at the time. There was the constant thinking that you weren’t sure what dragon/knight/goblin was going to turn up in the next scene. Normality turned on its head, a strange event, the combined power of people’s beliefs, group mentality,distrust of an outsider and the need to guide somebody through all this. Scratch these words into the wall, this is what I’m aiming for. I want this to be a story spoken in a hushed tone, from a mistuned radio in the early hours of the morning. An e-mail arrives from The Traverse this morning. Thank you for sending us your play, Seven Lucky Stars. This is not a play we are in a position to produce. As you may know, most of the plays we produce are commissioned in-house. It is very rare that an unsolicited script makes it to one of our stages. We are grateful to have had the opportunity to connect with your work. Engaging with writers at all stages of their career is central to our Artistic policy. Please keep an eye on our website and our season brochures to keep up to date with the variety of writing initiatives and work we have on offer, or click here to sign up to receive Traverse Enews. For your information we are now only accepting online script submissions, you can find out more about the new script submissions process by visiting http://www.traverse.co.uk/writing/send-us-your-writing/ . It looks like the standard, generated rejection response but then a place like The Traverse could hardly be in a position to write personally to everybody who sends them material. Whilst receiving this kind of reply might be a cue for being a bit downhearted it’s far better than receiving no response at all (which has happened to me before). I’m not under any illusion of thinking Seven Lucky Stars will be taken in it’s current form and performed professionally as this hardly ever happens and the script would probably need somebody with a better knowledge than I to read over before another rewrite. This is hardly the end of the world.